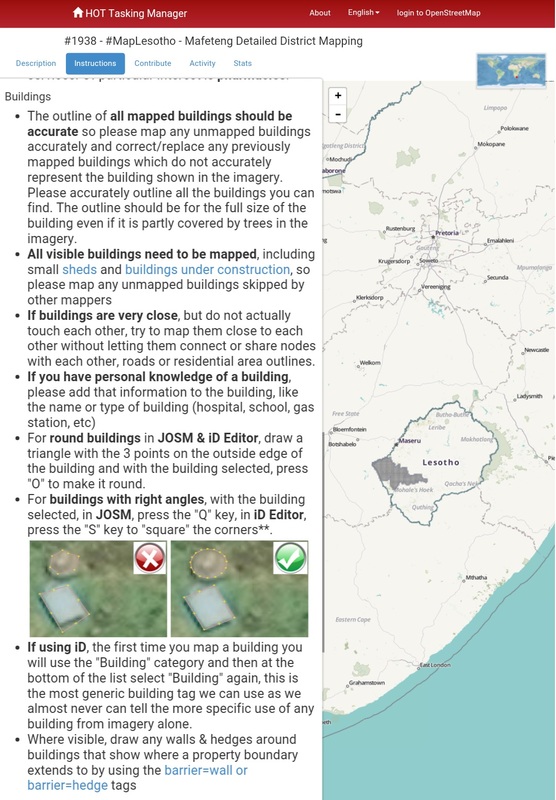 Yesterday evening #MapLesotho DaCorr launched another eleven tasks on HOTOSM. These tasks match perfectly the ten districts of Lesotho, with a task for Maseru City being the eleventh. Three things drive the mapping tasks. of course it is designed to do what is orthodox in improving from a basemap. But it also has a to find unmapped things and improve the tracing significantly. Finally there are a number of items that will drive forward the foundation of settlement planning in Lesotho. In the first phase a lot of buildings were skipped over in the rural mapping as they were optional in the task instructions. On this last point there is an initiative to apply a methodology to mark the areas of human settlement on all scales. This will help enormously to start with the calculations of built up area and density, rather than calculating from known sizes of districts and community council areas. This is a big help to Lesotho’s Planners. They can see low densities and try to earmark those places to meet demand for land, rather than allowing the land take to constantly and unsustainably sprawl out, at the expense of Agriculture. In order to kick-start this new phase the OSM community in Lesotho means to pass a modem clockwise around the country starting on the 1st June and finishing on the 30th. A schedule was developed to maximise access to the Modem. Its like a big relay race, with gatherings in the district camp-towns and of course Maseru. Watch out for the tasks on the hotosm projects list. We have Quthing, Mohale’s Hoek, Mafeteng, Maseru City, Maseru District, Berea, Leribe, Buthe-Botha, Mokhotlong, Thaba Tseka, and Qacha’s Nek. Also watch out for #MapLesotho tweets in June as the Modem travels around the mountain Kingdom.